Giuseppe Garibaldi (1807-1882). Garibaldi was a central figure in the Nineteenth Century movement for Italian unification. Garibaldi became an international figure synonymous with promoting national independence and republican ideals. He led successful military campaigns in both Latin America and Europe and became known as the ‘hero of two worlds’. His efforts in Italy played a very significant role in leading to Italian unification. Garibaldi was born 4 July 1807 in Nice, France. His family were fishermen and coastal traders, and for 10 years he served as a sailor himself. In 1833, he served in the Navy of Piedmont-Sardinia. During a voyage to Russia, Garibaldi became acquainted with the Republican ideas of Giuseppe Mazzini. 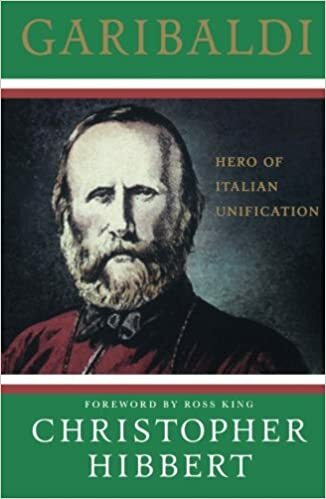 Garibaldi enthusiastically supported the aims of Mazzini’s Young Italy and became a life-long supporter of Italian unification under a democratic Republican government. In 1834, Garibaldi participated in a failed insurrection in Piedmont, and like Mazzini was exiled to France. In 1846, news from Italy encouraged Garibaldi to return home. In 1846, the new Pope, Pius IX instituted liberal reforms which encouraged Garibaldi to be hopeful of progressive change. In the revolutionary year of 1848, Garibaldi found himself back in Italy and he offered his services to the Sardinian Monarch – Charles Albert. Although Garibaldi was a Republican, he was willing to sacrifice his republican ideals in the hope of supporting Italian unification first. However, despite minor success at Luino and Morazzone, the First Italian War of Independence was unsuccessful. In 1849, Garibaldi was in Rome, which had just been declared a Republic, however, it was under attack from French forces loyal to the Pope. At the request of Mazzini, Garibaldi led the military defence of Rome and scarcely escaped with his life. Faced with the overwhelming numerical superiority of the French, Garibaldi had to withdraw his forces to the Apennine mountains. Depleted in resources and lacking the support of the government, Garibaldi was forced to emigrate again. This time he moved to New York, US where he joined a community of Italian expats. But, Garibaldi was soon on the move again, sailing a trading ship ‘The Carmen’ around the world. In 1854, Garibaldi sailed in another ship for Tyneside, England. As in many other parts of the world, Garibaldi was warmly welcomed by the working men of Tyneside, who saw Garibaldi as a defender of democratic ideals and opposing injustice. Garibaldi returned to Italia in 1854, when he used an inheritance to buy a farm on a northern island of Sardinia. For a few years, he was able to devote himself to agriculture. However, in 1859, the Second Italian War of Independence broke out and Garibaldi was appointed a major general with a guerilla force based in the Alps. Garibaldi felt supporting the Piedmontese monarchy was the best chance of achieving Italian unification and so he again sidelined his republican ideals to work towards the ideal of Italian unification. In 1860, he successfully led a relatively small force to military victory in Sicily. By defeating the Neapolitan troops with a diverse band of volunteers and local peasant support, Garibaldi gained worldwide renown and became a hero for the Italian cause. 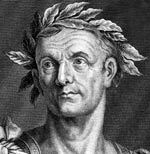 After conquering Sicily, he sailed to mainland Italy (with the help of the British Royal Navy) and led his growing volunteer army to Naples. The advancing army was welcomed by the Italian population. But, it was with the help of the Piedmontese Army that Garibaldi was able to defeat the large organised Neapolitan army. Garibaldi would have like to continue his march onto Rome and create an Italian republic. But, he knew his army was too small – relying on his much stronger Piedmontese ally. Garibaldi agreed to give his recent gains in Sicily to Victor Emmanuel II – King of Piedmont as a way to effectively promote Italian unity. Garibaldi saw Victor Emmanuel II as the figure who could most effectively bring about the unification of Italy. This meeting on the 26 October 1860 is considered a very significant date in the quest for Italian unity. Garibaldi greeted him as King of Italy, and this helped cement the idea of Italian unity. After this momentous occasion, Garibaldi rode to Naples not wishing to receive any accolades for his services. Although this was a step towards unity, Mazzini and Garibaldi still desired to see a republic and also see the inclusion of Rome and the Papal States. Assuming he would have the support of the new Italian government, Garibaldi marched to Rome against the forces of Napoleon III. However, fearing the reaction of Catholic forces sympathetic to the Pope, the Italian government refused to back Garibaldi’s attempt. They even sent Italian forces to defend Rome against Garibaldi. Garibaldi was injured in the foot, but the fighting ended quickly. Garibaldi did not want his soldiers firing on fellow Italians. Again, Garibaldi was willing to swallow his pride for the long-term goal of Italian unity. Garibaldi returned to fight for Italy in the Third Italian War of Independence. Garibaldi led his Alpine troops in Trentino and was moderately successful. Due to the strength of Italy’s ally – Prussia, Austria ceded Venetia to Italy, but Garibaldi’s gains in Trentino were lost. Garibaldi continued to agitate for the end of the papacy and led another small force against the Rome garrison. But, Garibaldi was unsuccessful and suffered another injury. Garibaldi dedicated his life to the cause of Italian unity, but he was also interested in democracy throughout the world. In 1861 at the outbreak of the American civil war, he urged Abraham Lincoln to make the civil war conditional upon ending slavery. Garibaldi was held in such high regard, that Garibaldi was even offered a command in the Union army. Garibaldi rejected the offer because he wanted Lincoln to make firm opposition to slavery. When Lincoln finally agreed to the Emancipation Proclamation in 1863, Garibaldi threw his whole political support behind Lincoln’s endeavour. In 1870, the fall of the Second French Empire led to the creation of a new French republic. Despite fighting French forces for many years, Garibaldi was true to his Republican principles and switched allegiances in 1870 to offer his support to the new French Republic. As was typical with Garibaldi, he backed up words with deeds and went to France to assume command of an army of volunteers. In 1879, Garibaldi founded the “League of Democracy” this advocated universal suffrage, female emancipation, the abolition of ecclesiastical property and a standing army for national unity. Along with Giuseppe Mazzini, Garibaldi supported the creation of a European federation. He expressed an expectation that it would be a greater Germany that would lead a united Europe. 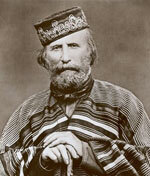 Garibaldi died on 2 June 1882, at the age of 75. He wished to have a simple cremation, though he was buried by his farm on the island of Caprera. Garibaldi was strongly anti-clerical and anti-papacy. However, in some writings, he supported Christianity. However, his approach to Christianity was more individualistic with little interest in the church. He was a leading figure in the Il Risorgimento (Unification of Italy). He was a member of Mazzini’s Young Italy and the Carbonari. 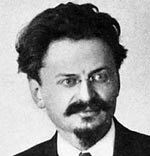 Towards the end of his life, he became more sympathetic to socialism, but generally, he didn’t concentrate on social reform. He was also a Freemason and saw the organisation as an opportunity to spread progressive ideas within an international movement. Garibaldi was considered to be an honest man without desire for great name and fame. This personal nobility and his military victories helped to gain the support and love of many ordinary people. His sincerity attracted many to support his cause of Italian unification. Ironically, despite being a great military strategist, Garibaldi became increasingly wary of war and expressed pacifist ideals towards the end of his life. He was married three times and had four children with his first wife, Anita. Citation: Pettinger, Tejvan. “Biography of Giuseppe Garibaldi”, Oxford, UK. www.biographyonline.net Published 12th Jan. 2013. Updated 20 January 2018.